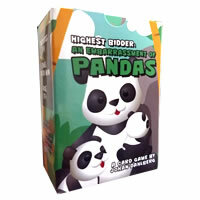 An Embarrassment of Pandas is an entertaining card game where players attempt to be the highest bidder on particular groups of animals in a specific order. Action cards make this game very unpredictable yet very re-playable. You'll try your hardest to have the best bid all while your plan gets foiled by the player next to you. This card game is easy to learn how to play and is best played by two to five players. You'll learn all the correct names for different groups of animals and have a blast playing this lighthearted yet partially strategic game. Purchase your copy of An Embarrassment of Pandas today. Review Completed (2018-08-06) Why on earth is this game called An Embarrassment of Pandas? Well, just like a group of wolves are called a pack and a group of birds are called a flock, you guessed it – a group of pandas are called an embarrassment. We don't usually start off a review on a sour note but the only thing this game has to do with pandas is the art work on the back of 80% of the cards. The rest has to do with using bamboo (the money card) mixed with action cards to win the highest bid on other groups of animals. Now that we've vented on the slightly misleading theme (how embarrassing), once we gave up on what this has to do with pandas, we loved it! We really, truly loved it! This simple card game is packed with strategy, good luck and very bad luck. A quick read through the little tiny rule book and you'll be off and playing in minutes. 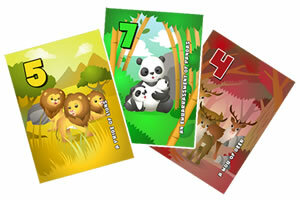 Each player must play at least one card on the three animal cards each round (again, some of the animal cards aren't even animals…). This will either give you points or take them away. The order you play your cards determines what happens and others can foil your plan to be the highest bidder. Essentially, you take your best shot and what you think is your best strategy and watch it get destroyed or improved. Even the worst possible bid might win. The suspense of what is going to happen next was our favorite part. Back to the theme. The art work is cute and the cards look nice. The illustrations are nice and the clarity and purpose of each card is easily understood. The previous version of this game was called "highest bidder" in which players used money to win different paintings. This makes sense but the cards were not nearly as colorful and fun as this one is. Perhaps a different title like "Zoo Builder" or "Animal Collections" or "Animal Control" would be more clear with "money" instead of bamboo. 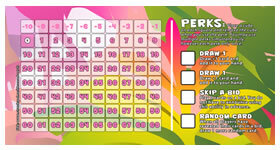 Keeping score is suggested in the game rules as turning your cards a certain way to keep track. We just used a piece of paper which was way easier to remember. There is an optional score card that isn't included in the game that would be super nice to have and looks nicely made. For the price of the base game and the optional score card, paper or the card flipping technique works fine. One more thing we really liked is the simple point and money system. The highest point card and money card is 5. You're not bogged down by hundreds or thousands of units. Granted things can get doubled and cut in half but the math is fairly easy. In summary, An Embarrassment of Pandas is a fun, suspenseful and strategic card game with some random good and bad luck. It plays relatively quick with a fun surprise on the last round. This card game could be played by just about any type of game player out there and they'd have a good time playing it. If you have the most points at the end of the game you'll win. Inside the game box are 99 cards and the official An Embarrassment of Pandas game rules and instructions. Please keep in mind that the official An Embarrassment of Pandas dice-card rules and instructions could be different depending on the game version you have. 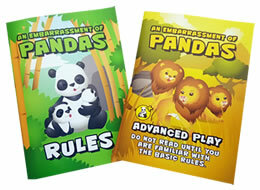 The rules below are some of the exact directions on how to play An Embarrassment of Pandas. Share with us your comments, funny stories, tips, advice, strategies, creative ways to play, questions about how to play, problems with the rules or anything you want about An Embarrassment of Pandas. All submissions will be reviewed within 24 hours. Click here to add your An Embarrassment of Pandas comments.